The Florida Department of Education (FDOE) is now accepting public input on the Every Student Succeeds Act (ESSA) and would greatly appreciate your engagement in this very important dialogue. Through July 22, 2016, all members of the public will be able to submit comments on each component of the law, and we will consider this feedback as we develop Florida’s draft state plan. 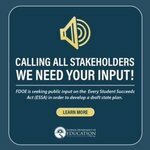 To access the public input form, please visit http://www.fldoe.org/academics/essa.stml. For ease, we have divided the feedback form into specific sections named in the law (#1-7), each title named in the law (#8) and U.S. Department of Education draft regulations (#9). You are welcome to provide input on as many of these as you would like, but you are not required to respond to all. Likewise, it is not mandatory to answer every question on a specific topic. 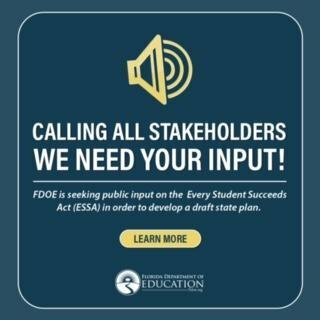 To access the public input form, please visit http://www.fldoe.org/academics/essa.stml.